Tank, a medical service dog belonging to disabled Marine veteran Manny Rivera, the night he was injured after an alleged dog attack. Rivera is accusing Snowdance Sports owner Steve Cain of intentionally using his dog to attack Tank, while Cain denies any wrongdoing. A Keystone business owner has been issued a summons by the District Attorney’s office over allegations he had intentionally had his dog attack a veteran’s service dog on the evening of Feb. 12 outside Pizza 101 in Keystone. 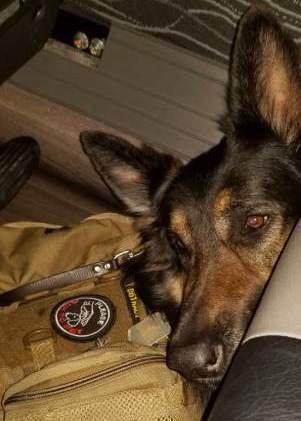 The charges stem from the Feb. 12 incident, when Cain was accused by a disabled Marine veteran, Manuel Rivera, of intentionally siccing his dog on Rivera’s service animal, Tank, a German shepherd trained to alert Rivera of oncoming seizures and help him prevent falls. Rivera alleged that Cain was intoxicated and was trying to get the dogs to fight. Cain denies siccing his dog on Tank, accusing Rivera of blowing the situation out of proportion and creating a dangerous situation by not moving his service dog from the area when asked. Rivera, who has severe epilepsy, served in the Marine Corps for 10 years. An epileptic seizure in 2012 made Rivera fall and hit the back of his head, causing a traumatic brain injury. Rivera now regularly suffers from flashbacks, cognitive disorder, depression and night terrors. He was medically discharged from the military in 2014.